First some housekeeping. I should mention that Subterranean Press has a handful of the leatherbound signed limited edition of LEGION leftover and available for order on their site. In completely unrelated news, my assistant has uploaded another Twitter posts archive. There are two Writing Excuses episodes up that I haven't talked about yet. First Maurice Broaddus joined us to talk about writing the other—writing other cultures, races, genders, etc. Then the latest episode features Dan talking about the Seven-Point Story Structure and its use in outlining. There are two "The Science of Allomancy in Mistborn" posts from Lee Falin at Tor.com that I neglected to link. First is Pewter, followed by Iron and Steel. The rest of Lee's posts are here. I love that people are thinking about things like this and coming up with ideas on how they might work. Now for the biggest announcement today. 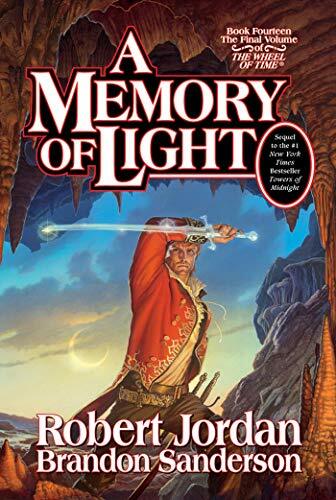 As you know, A MEMORY OF LIGHT will be released in hardcover on January 8th, 2013. I will be touring to support its release, but they're still deciding whether the first release event will be in Provo or Charleston. As soon as it's announced, I will let you know. I realize that not everyone can make it to one of my signings. It's unfair if you live in Germany but want a numbered copy. Therefore, I've started doing virtual booksignings with Weller Book Works (formerly known as Sam Weller's)—a wonderful independent bookseller in Salt Lake City that has been a supporter of my books since I was a nobody—alongside the standard signings I do there. UPDATE: NOW SOLD OUT! If you ordered via email and haven't heard back yet, don't worry—your order is counted in the total. They are getting back to everyone as quickly as they can. I will be going in to Weller's sometime right before Christmas to sign, number, and personalize 700 copies of A MEMORY OF LIGHT. Weller's will then ship them out; they will try to time the shipping so the book arrives at your door on January 8th. However, they're not allowed to deliver before that date, so they can't cut things too close, and some books may arrive after the 8th. If that's the case, though, they'll try to keep the delay as short as possible. International orders will be shipped first, since those have the longest transit time. Due to the size of this book, Weller's will be shipping each book in a Priority Mail medium flat-rate box, which unfortunately drives the price up. But the book itself has a discount of 20% for preorders by December 7th, which helps offset that. Shipping will be $12.00 in-country, $34 to Mexico and Canada, and $49 to other international. If your order is shipped inside Utah, there will also be sales tax. (Note that Weller's cannot track packages internationally. They've tried.) I'm really very sorry that the shipping cost is so high, but books this big just won't fit into cheaper envelopes. On the plus side, the box can fit TWO books, so if you buy two to ship to the same address there is no increased shipping charge. When you call Weller's, please be certain to tell them (even if they don't ask) specifically how you want the book personalized. If you don't tell them specifically, they will have it signed but not personalized. Simply telling them your name is not enough. You have to tell them "I want it personalized to John" (for example). If you don't want it personalized, tell them "Signature Only" just in case. About the numbering: If you get a book from one of the two release events (Weller's or the BYU-or-Charleston midnight release), I'll number your copy. These numbers are less about being limited editions and more about getting a special add-on, an indication that you made it to one of the initial events. The numbers will trade off in blocks of 100, so books through Weller's will receive numbers 101–200, 301–400, 501–600, etc. Note that if the midnight release ends up in Charleston, I will definitely still sign books in Utah sometime during the tour, without numbering. Preorder deadline: NOW SOLD OUT! Note: You may pay by credit card (on phone orders) or PayPal only.